As is often the case I seem to forget to review the really good dark beers I drink, apologies again stout lovers. (Seriously keep emailing me and I'll remember!) Anyway here's a very underrated beer from one of my favourite Melbourne breweries; Kooinda. Kooinda is located in an industrial warehouse in Heidelberg. It's a great story, with these guys initially starting in one of their sheds and pumping water from their swimming pool in to cool the tanks, before moving to Heidelberg last year. It's a true success story! This beer is not their most well known but in my mind is one of their best! Let's get into it. Firstly apologies for the photo quality, it's almost too light in my bar now! Anyway the pour is a dark brown colour with a creamy, almost yellow head. The heap dissipates very quickly, as the photo shows, very quickly there is only a ring of foam left, before even that disappears. It certainly isn't the most appealing of beers to look at. Onto the nose and it's much better than the appearance. It's relatively light for the style but coffee, chocolate and some dark fruit flavours are all detectable. I think it's plum that is the most dominant fruit flavour, which is a slightly unusual - it's not one I can remember smelling before. The overall feel of the nose is slightly sweet, but certainly not overpoweringly so. 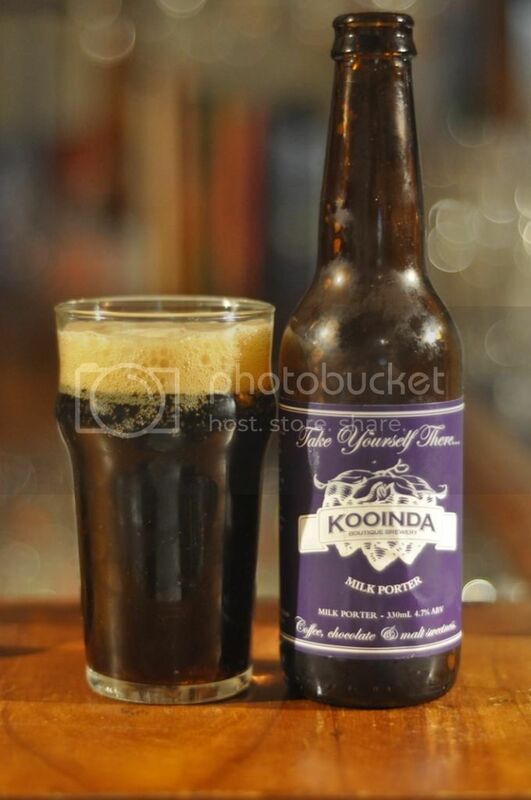 Kooinda's Milk Porter has good roast qualities up front. There's actually quite a big secondary flavour of chocolate milk, not surprising I suppose when it's called a Milk Porter... With that "revelation" out of the way the dark fruits begin to be noticeable as the beer warms, they aren't anywhere near as strong as the nose would have indicated. The overall feel of the beer is slightly on the sweeter side but it really fits in well with the creamy mouthfeel. This is one of my go to wintery drops and it's one I'd highly recommend you trying. I feel that if this beer was better known it would be talked about in the same breath as great Australian Porters like Mornington's. It is on the slightly sweeter side for the style but not enough to put many people off in my opinion. Give it a go if you see it and let me know what you think.